Update 2: Added another Pokémon stage. I think this might be the last one. 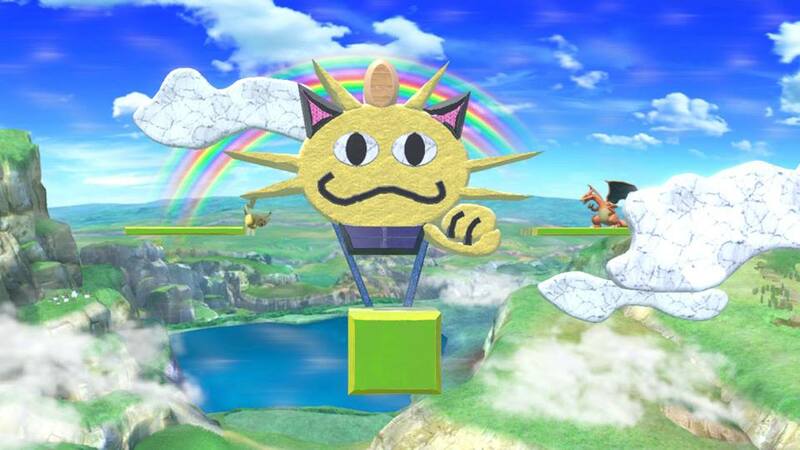 Update: Added a new Pokémon stage. You don’t want to miss this one. 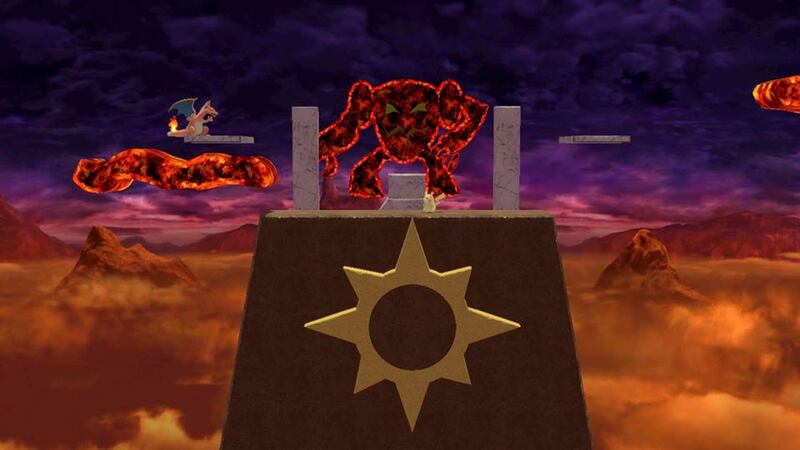 Unfortunately, I couldn’t make a boss battle against Heliosol in its Ascended Form, but I can still have Heliosol Regular Form appear in the background, and attack with waves of fire that move back and forth across the stage. Battle inside of a Tetris board. Watch as a player drops an L-block into place, and activate a bomb block to clear the board. A cannon-filled airship just like the ones originating in Super Mario Bros 3. Includes my custom-made self-firing cannon balls. Designed to look like a Bowser fight from the original Super Mario Bros. You can even hit the “ax” to destroy the bridge and send your opponents plummeting into lava. 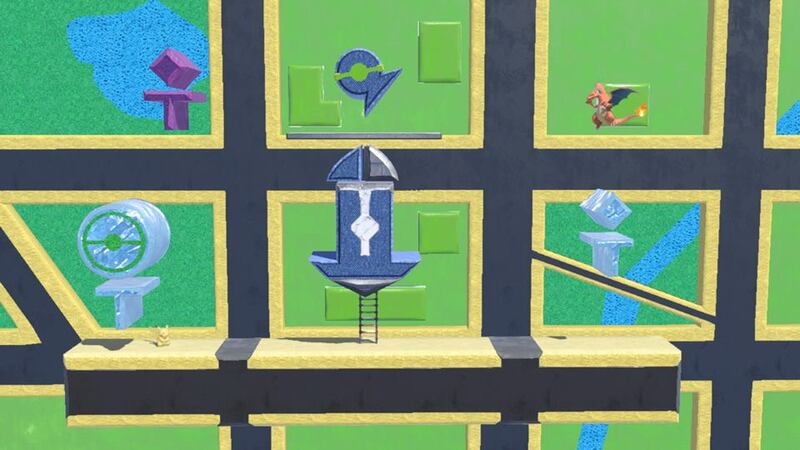 A zero-gravity battle arena that uses upward blowing wind to negate gravity. Can you avoid the asteroids as you fight your opponents in an entirely aerial battle? 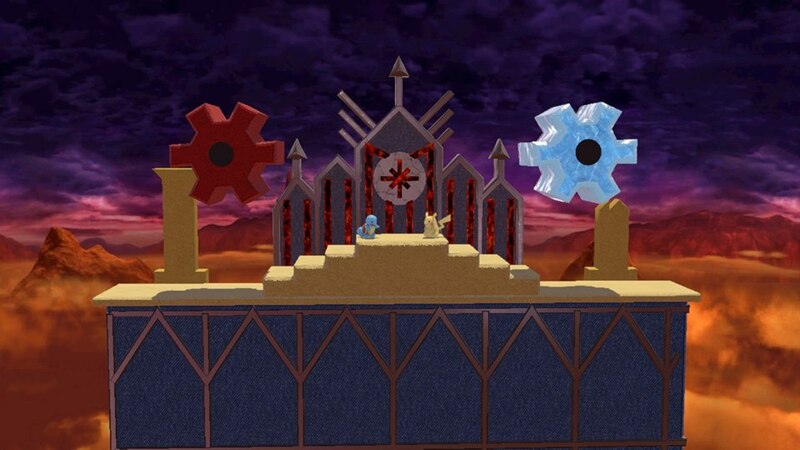 If I make any more stages in the next week, I’ll update this post with them. DISCLAIMER: I haven’t actually subscribed to Nintendo’s online service, and have uploaded these stages using a seven-day free trial. I do not know if these stages will still be available to play when my trial runs out in a week. Description: This Legendary Pokémon is said to be made of crystallized light, allowing it to run at the speed of light. It is virtually never seen, as it is not visible when running at max speed. Trivia: Velocivity is known to exist because it takes interest in certain individuals and reveals itself to them. Velocivity will travel around the globe several thousand times per day. Not only can it travel at the speed of light, but it can also process its surroundings and react at the speed of light. The user attacks at the speed of light. This attack hits before any other move, no matter what. In-Depth Description: This move has a speed priority of +6, meaning that it has priority even before moves like Extreme Speed, Protect, or Helping Hand. Gives priority to Light-Type moves. Wow, the past 24 hours sure have been crazy. I never want to watch a bad movie again! Anyways, while Team Rocket may be kind of crazy, they were not lying about the Team Rocket Movie. No joke, The Team Rocket Movie is a real thing. It is currently being written and will be released soon. To be clear, this is not Cosmic Quest the Movie 3, but rather an original spin-off movie to accompany Cosmic Quest. Should be interesting. Meowth: Can I get a drum roll please? Jessie and James: It’s time for our main event! The Team Rocket Q&A Session! Meowth: You guys have been posting questions all day, and now it’s our turn to answer them! James: You’re about to get to know us on a whole new level! James: Just to be clear, this question was asked before either my Rocket Reviews episode or the Bossies aired. For reasons stated there, I think we can all agree that Mewtwo Strikes back is our favorite movie. Meowth: You saw the post about us selling mechas? It’s scams- I mean, it’s marketing strategies like that which keep us funded. Jessie: Of course, any extra cash we have goes into my wardrobe shopping. Meowth: Okay, a user who was later identified as MajorBrony95 asked tree questions at once. James: Let’s take them one at a time. Announcer: Welcome to Meow We’re Talking, the only talk show hosted by a Pokémon! Announcer: And here’s your host! Meowth! Meowth: Helloooooo internet! Let me just say, it’s great to be back! Did you miss me? Of course you did! Let’s kick this show off! Tonight we have quite a group of guests! It’s all my Pokémon co-stars from the upcoming Team Rocket Movie! Put your paws together for Mime Jr.! Buzzsaw: Buzzzz zzzz zzzz zz zzzzzz! Meowth: A big welcome to all of you. It’s great to have the entire Pokémon cast here, in one place. Meowth: You got that right, buddy! With all of us being Team Rocket Pokémon, I feel we’ve always been close, but shooting a movie together really did bring us closer, wouldn’t you guys agree? Mime Jr.: Mime mime, mime. Meowth: Alright, I’ve got to start things off by congratulating Wobbuffet on his earlier Bossy Award for Best Team Rocket Pokémon. I must say, I’m shocked it wasn’t me, but if it wasn’t me, then I guess you deserved it. Wobbufet: *Holds up trophy* Wobbuffet! Meowth: No need to gloat. Anyways, since we got the gang together, I figured I’d ask Repiv here a question. Meowth: Okay, nearly 20 years ago, back when you were just a wee Ekans, you went on record claiming that there are only bad people, and no bad Pokémon. You’ve become pretty famous for this assertion. Now that you’re older and wiser, have you finally changed your mind? Meowth: … … … Realy? You sure about that? Meowth: *Sighs* Okay, to each his own, I guess. Changing the topic, Mime Jr., I had to do some hard bargaining with James to let you stay up past your bedtime to appear on the show. How are you feeling right now? Meowth: Glad to hear it. Okay, and Haking, I heard you have a pretty big scene in The Team Rocket Movie. Anything you think you could tell the audience about? Haking: Hak hak! Haking! Hak hak hak! Hak! Meowth: Excuse me, spoilers! You should be more courteous to our audience, who know nothing about the movie and want it to be a surprise. You just gave the entire plot twist away! Meowth: Oh well, nothing can be done about it now. Hey, that reminds me. I’ve got a preview of The Team Rocket Movie to show. Hows about we watch that thing? Roll the clip! Pierce says nothing else and pulls out a spray canister. He begins to to spray its contents around the room. As the mist of the aerosol spreads, it reveals red laser lights criss-crossing across the corridor. Pierce stows away the canister and states critically, “The Boss sent me here as back up, due to the importance of this mission. This room is protected by security lasers. Make contact with just one of the beams, and you’ll set off the facilities security system.” He looks them over critically. “I expected better from you three.” Without another word, he leaps forward. With a complex series of leaps, flips, rolls, ducks, and weaves, Pierce makes his way to the other side of the corridor, never once touching a beam. Meowth: Meow we’re talking. See, doesn’t that look like a great movie? I was shocked when they told us that Pierce was going to be in the movie. I thought that guy vanished off the face of the Earth. Meowth: Yeah, he’s from Unova. For whatever reason, you weren’t around at the time, so you wouldn’t know him. But trust me, he was one of the more interesting parts of our time in Unova. Buzzsaw: Buzzzz zzzz zzz zz zzzz! Meowth: Unova wasn’t that bad. Mime Jr.: Mime, mime mime. Meowth: Okay, yeah. It was that bad. But things got better, and now we have our own movie, so it doesn’t matter anymore. Look at that, that’s all the time we have for tonight! Thank you all for watching. If you have any questions for me, or any of my guests, be sure to leave a comment and ask. The Team Rocket Q&A Session is nearly upon us. Bye! We interrupt this program for a message from our sponsor. Kid 1: Sigh. I wish we had something better for breakfast than this boring toast. Kid 2: Yeah, we’re evil geniuses in the making. We need to fuel our insidiousness. James: *Appears from nowhere* I can fix that! Kid 1 and 2: James from Team Rocket!? Kid 1 and 2: Woah! Rocket-Os! James: That’s right, Rocket-Os, part of an evil breakfast! Rocket-Os special recipe provides a growing villain with all the nutrients they need to become a criminal mastermind. Not only that, but they taste great too! Kid 1: They really do! Kid 2: I feel more evil already! James: That’s the spirit! And don’t forget, every box of Rocket-Os comes with a free Team Rocket trading card! See if you can collect all eight! Kid 1: Woah! I got a Jessie card! Kid 2: I got a James card! James: Naturally, the best card. Kid 1: Fine, I’ll just take it! Kid 2: Hey, give that back! James: See? Just a few bites and they’re already committing petty thefts. Kid 1 and 2: Thanks Rocket-Os! James: And for those who like to walk on the darker side, try Chocolate Rocket-Os! Available in the cereal aisle.